Exercise is important for women with rheumatoid arthritis because the right exercises can help relieve joint pain and build muscle strength. There are three main groups of exercises women with RA should incorporate into their regular fitness routine: stretching, strength training and cardio. Before we get into the exercises, it's important to start out slow and build up strength as you go to avoid discomfort and injury. If your joints are inflamed or you're not feeling well, rest and drink plenty of water. Once you feel better and are able to resume activity, listen to your body and talk to your doctor if there are any lingering issues. Be sure to talk to your doctor before starting any new exercise program and to find a treatment plan that will keep your arthritis under control so you can enjoy a more active lifestyle. That said, here are 10 exercises that every woman with RA should be doing on a regular basis. Lie flat on your back and slowly draw one knee into your chest. Hold for 8 to 10 seconds, then return to starting position. Repeat 3 to 6 times, then switch legs. Place your forearm flat against a wall. Keep your arm at a 90-degree angle and gently lean forward until you feel a stretch through the upper portion of your shoulder and chest. Hold for 8 to 10 seconds, then return to starting position. Repeat 3 to 6 times. Wrap a resistance band around a sturdy object in front of you. Hold the ends of the band in each hand with your arms straight out in front of you, palms facing each other. Make sure the band is tight. Contract your upper back muscles and pull the band toward you, bending your elbows, keeping your shoulders relaxed. Slowly return to starting position and repeat 10 to 15 times. Wrap a resistance band around a stable object behind you. Hold the ends of the band taut in each hand, palms down, with the band on top of your arms. Squeeze your chest and press your arms forward at shoulder level. Bring your arms to full extension, taking not to lock your elbow joints. Return to starting position and repeat 10 to 15 times. Place a step board or a low platform in front of you (if your home has stairs, use the bottom step). Stand about 12 to 24 inches from the board, then step up with your right foot and lift your left knee up slowly. Return to start position. Repeat on the right side 10 to 15 times, then switch sides. Walking is a great form of cardiovascular exercise that you can do almost anywhere. Start out slow on a flat course. As you build up strength and endurance, increase your time and even try some small hills. 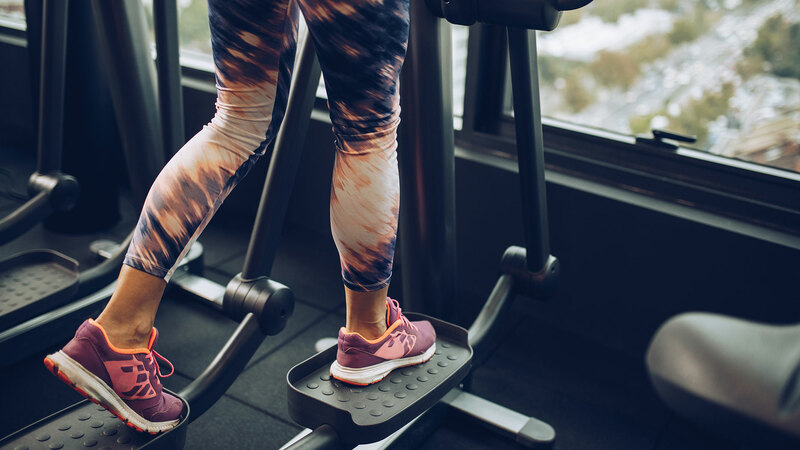 If you have access to a gym, the recumbent bike or elliptical trainer provides a great low-impact workout. Start with 10 to 15 minutes, two to three days a week. Yoga is great for relaxing, and it can aid in improving flexibility in stiff joints. Some poses may cause discomfort for RA sufferers, so be sure to speak with your instructor about modifications. A low-impact fitness class is a great way to have fun and work out at the same time. Check the class schedule at your local gym and talk with a trainer or instructor to decide which class would be the best for you. If available, water aerobics is a great option for those with joint pain. A version of this article was originally published in October 2010.